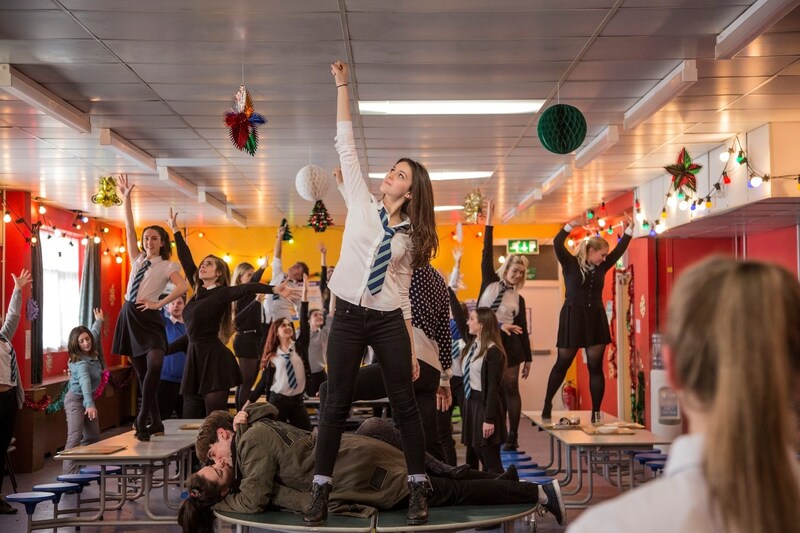 A low-rent Scottish-set take on High School Musical, crossed with beloved festive Brit-fun Nativity, and… Shaun of the Dead? John McPhail’s second feature has one helluva set-up; a pop-tastic teen musical that pits its leads against a flesh-hungry hoard of zombies as Christmas fast approaches, with plenty of blood and brains and bouncy show tunes thrown in for good measure. The stage is set for the oddball fave of the year; or at the very least, another fun-loving sing-along in the vein of Dexter Fletcher’s Proclaimers riot Sunshine On Leith – but with a bit more blood. And while there are definitely elements of both of these in Anna and the Apocalypse, neither quite manage to make it up to scratch. Just a small town girl (living in a not-so lonely world), Ella Hunt’s Anna dreams of breaking out of her tiny little Scottish existence and travelling the globe before setting off for uni. Instead her Dad (a truly lovely Mark Benton) says no, the demonic headmaster makes her life a living hell and her macho-man ex (who also happens to be the local school bully) just won’t seem to leave her alone. And if things couldn’t get any worse from there: all of her friends are being eaten alive and the whole world is on fire. Plenty to sing about there, then. And there’s absolutely nothing wrong with Anna’s happy-clappy West End soundtrack. In fact, there’s very little wrong with the first half of the film altogether. Hunt is a hugely likeable lead, the rest of the cast are padded out with great British talents (Paul Kaye’s shaggy-moustache-twirling school head is an absolute diabolical gem) and there’s just the right humour-to-horror ratio to keep it light. It might prove a little too saccharine for non-musical fans, but early-on McPhail seems happy to really let the cheese-ometer fly and the results are encouraging. But for whatever reason, the film seems to quietly slide off into a very different tone altogether in its second half; offing as many familiar faces as it can and all but forgetting the triumphant pop numbers. The final third in particular feels much more like a straight-up survival thriller, with Anna suddenly starting to lose everything that made it special in the first place. Not to mention the fact that without the self-aware sing-alongs, it all just starts to take itself much too seriously and the flaws in McPhail’s plans become all the more apparent. Early motivations vanish in not-so-much-as a puff of smoke, taking entire character arcs and much-needed pay-offs with them, and all of a sudden, you’re just watching any other zombie movie. And not a particularly well built one at that. There’s a reason Pierce Brosnan, Colin Firth and Julie Walters don’t all drop dead half way through Mamma Mia. There’s issues with the budget too, which really aren’t the film or its cast and crew’s fault, but it does definitely have a bit of a knock-on effect on the spectacle side. Some school-set musical numbers that are begging for more of an epic scale end up being squashed down into the absolute bare minimum, and quite a few just end up being entirely static. The fight sequences definitely fare better, but Anna’s a movie that deserves size and weight and (probably understandably, considering its hard-sell) sadly gets none of it. If you buy into the wonderfully post-Disney pop soundtrack and loveable leads from early on, there’s no doubt you’ll be able to hang on through the darkness that follows, but there’s no denying that Anna and the Apocalypse really suffers from an inconsistent tone. Character gaps and plot-holes galore really don’t matter when you’re having a blast, but the second McPhail and his team try to take the drama seriously, the cheap and cheerful exterior crumbles very quickly indeed. Anna and the Apocalypse was screened as part of Arrow Video FrightFest 2018 and will be released in the UK in November.